I had an epiphany moment last year-you see I had been listening to a lot of podcasts about leadership and business and those led me into podcasts about marketing. If you know anything about marketing gurus you know that they scream from the rooftops that building your email list is the most important thing you can do for your business. I’ve heard this for years but honestly never took it much to mind-I’m a blogger, I’m not selling anything, I just want people to stop by my blog to read my posts-pageviews are where it’s at, right? So once I finally realized I needed to change my email game I also realized that my current email server wasn’t going to work. 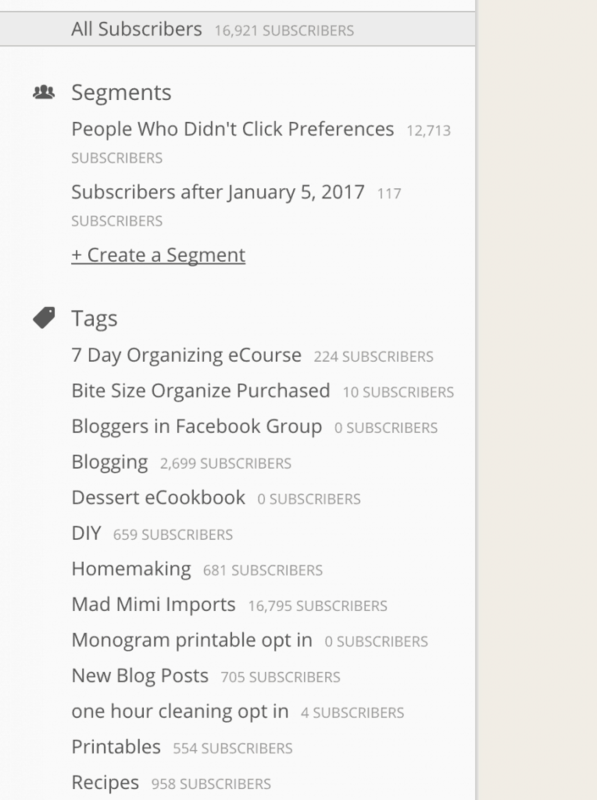 I started off years ago using MailChimp but as my list grew I switched to MadMimi for the lower price point and super simple to use platform. Once I realized I wanted to be able to create a variety of automated email sequences and have the ability to easily tag my subscribers by interest I knew I needed an upgrade. You see, technically, you can do these things in MadMimi and I’m sure in MailChimp too but it’s not a particularly user-friendly process. When I started researching other email servers that would help me with the marketing side of things I realized a lot of them were way too much for what I needed, then I found ConvertKit. 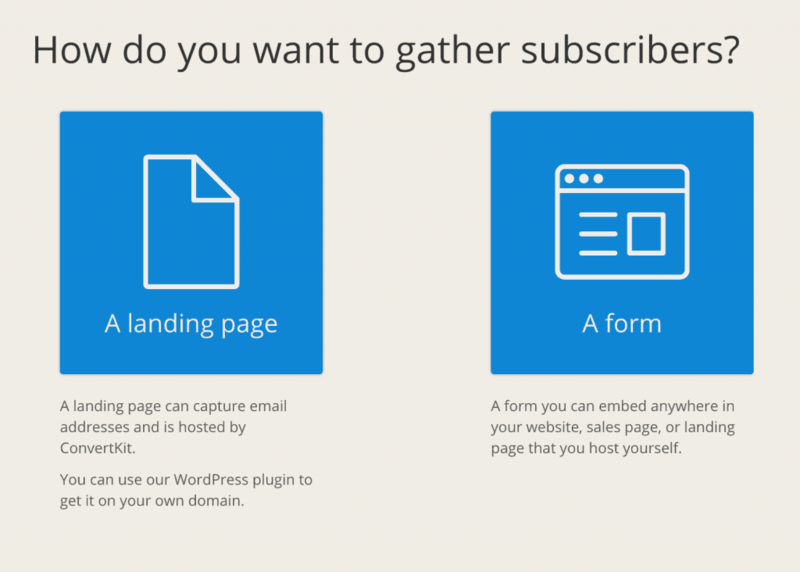 ConvertKit is an email marketing tool created for bloggers. 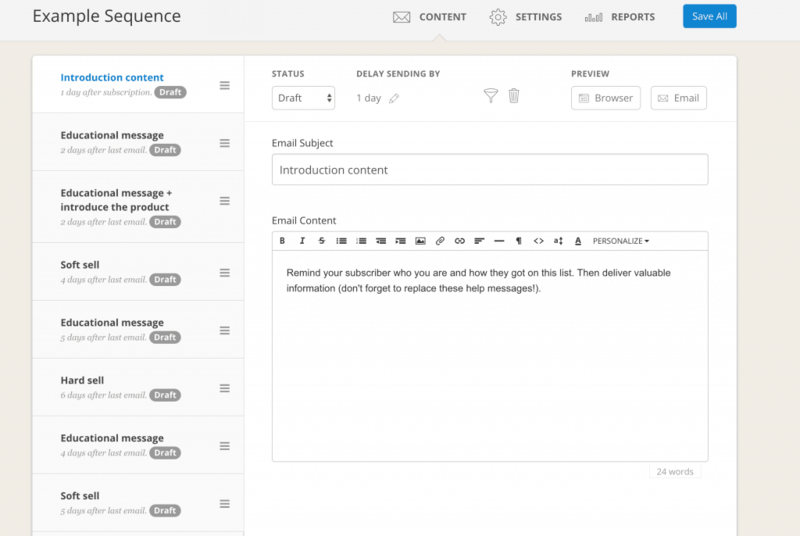 It makes email marketing super easy. 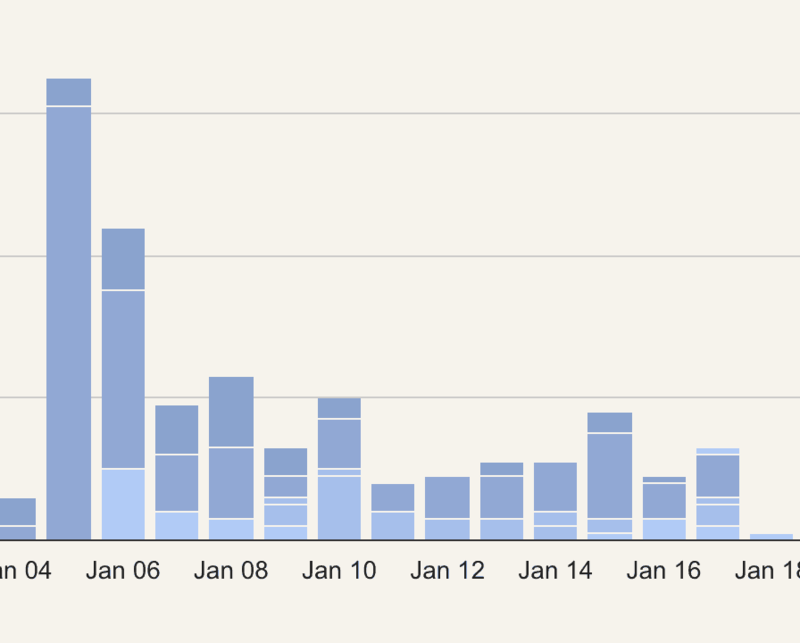 Here is a screenshot that shows part of the analytics I see as soon as I log into the platform. It shows how many new subscribers I receive each day and further breaks them down to what form they used to subscribe so I can instantly see what’s working and not working. If I click on the Subscribers in the menu bar I’m taken to my list of subscribers which I am not able to segment and tag with particular actions. 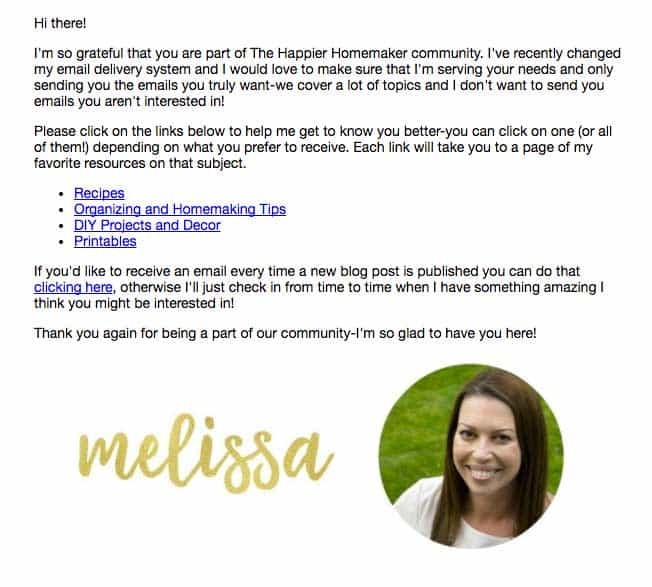 Because I blog about a variety of topics I can tag my readers by what they prefer to hear about and reduce the likelihood of them unsubscribing because I sent a recipe lover an email about blogging professionally! I also sent out an email when I first switched over asking my subscribers to click links in my email to let me know what they wanted to receive emails about. Each time they clicked the link it tagged the person with the subject. This way, if I send out an email with cleaning tips-only those that opted for that choice will receive it-again reducing the chance they will unsubscribe and increasing the chance they actually open the emails, which is obviously the goal! 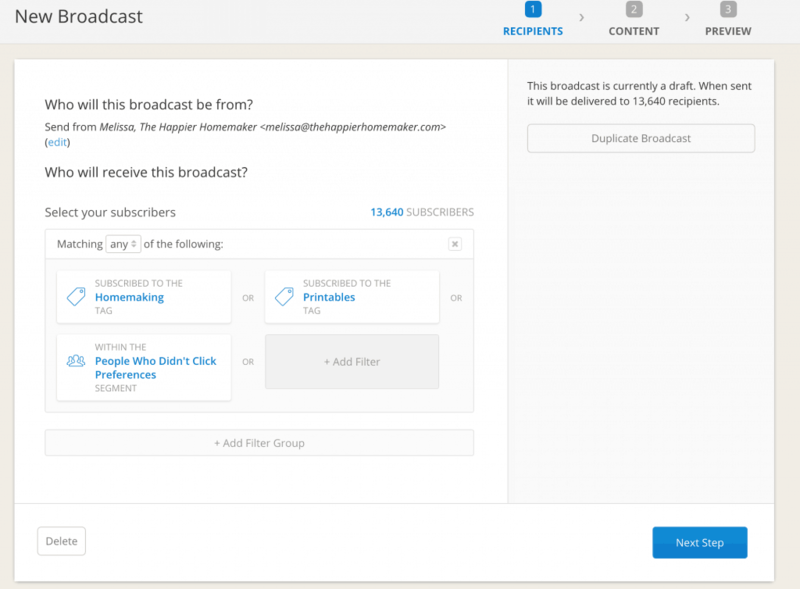 It’s very easy to customize who exactly you do and do not want to receive your broadcasts. In the next example you can see I’ve chosen everybody who subscribed after January 5th of this year who have not yet purchased my eBook. You can get so specific! 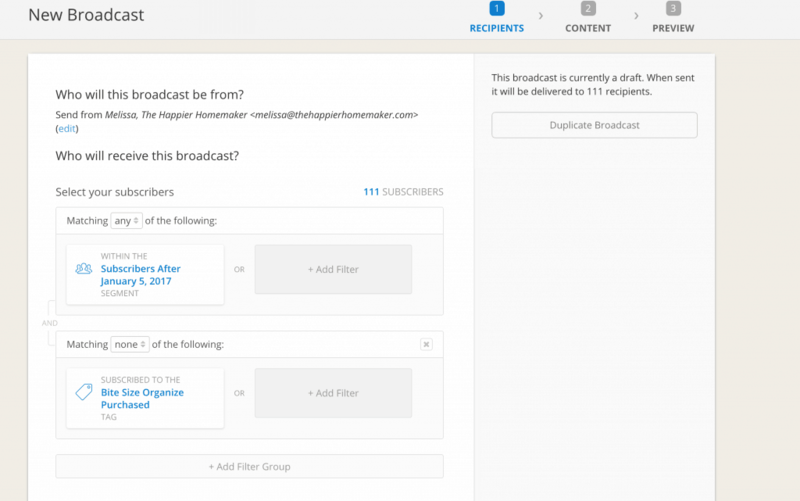 After composing your broadcast you can preview it and either send it immediately or schedule it to send at some point in the future. How to the fun stuff-Sequences. I think this is where ConvertKit really shines! In MadMimi I was able to create a “drip” campaign to send out scheduled emails automatically when someone signed up for something like an email course. ConvertKit’s Sequences achieve the same effect but in a much easier, more streamlined way. 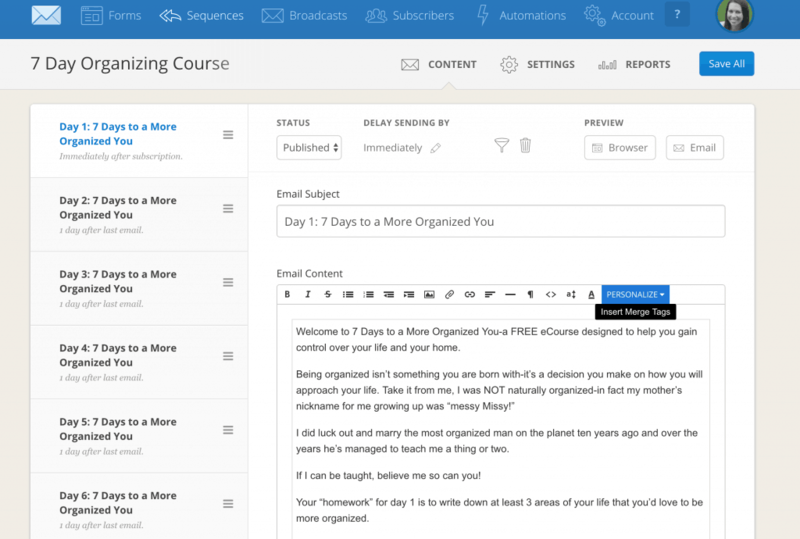 The emails are easy to edit and move around and customize. They also give recommendations of best practices for email topic, etc. to help those of us who might be hopping into this without a marketing degree! And last but not least, ConvertKit has tools to help you make a variety of form types for your blog readers to subscribe to your blog-you can even create landing pages with it! 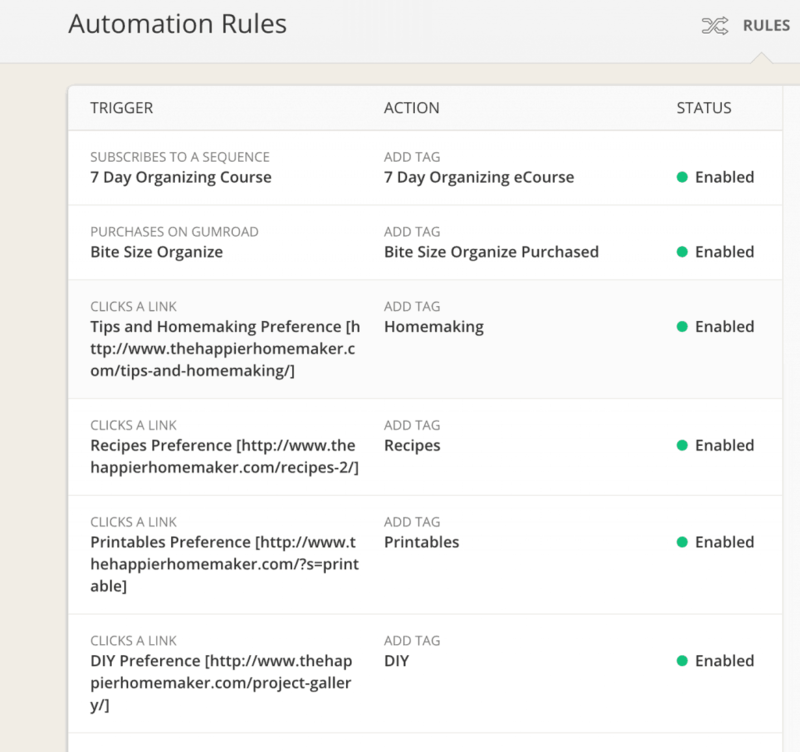 So bottom line-ConvertKit is pretty darn amazing. I put off joining a long time due to the price point being higher than MadMimi-I pay just under twice as much. 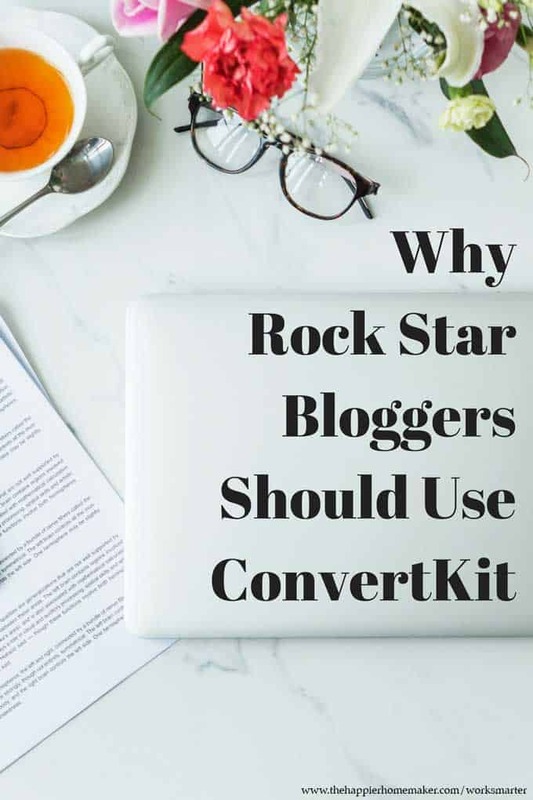 Honestly it was a leap for me, but because I know the reasons that email marketing is so important for bloggers and I know that ConvertKit can help me reach my end state goals for my business it was totally worth the investment for me. Questions? 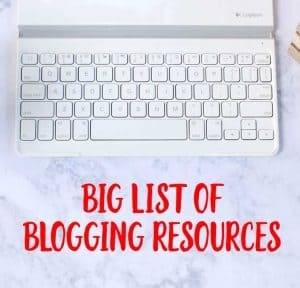 Hit me up in the comments or request to join our blogging Facebook group-I’m here to help! Great Article! I just started using ConvertKit about a month ago and I don’t plan on using anything else, I love it! Thank you for taking your time and explaining your way through the email service providers, I went quite a similar road! I have used a great deal of Mad Mimi, yet I also at some point realized that there is more to ESP than that. 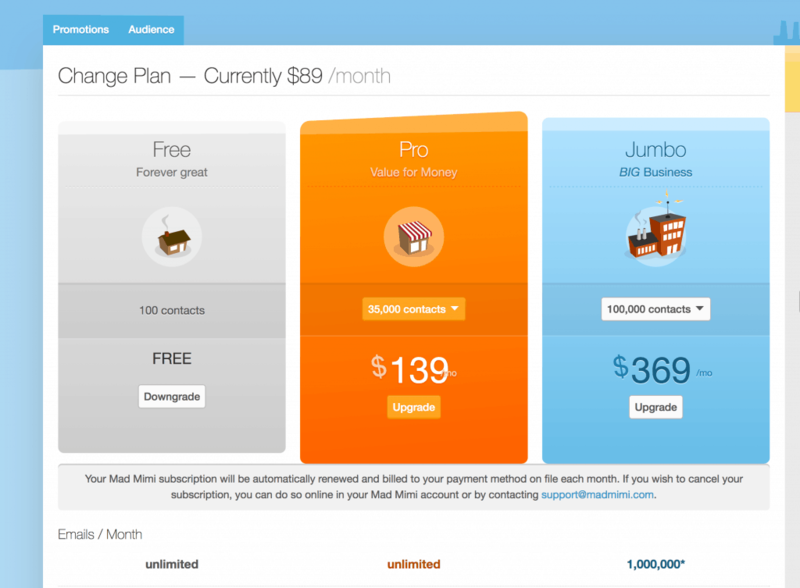 I have been considering between MailerLite and ConvertKit. But as I am not advanced in creating newsletters using HTML I really wanted to have drag&drop editor, I wasn’t sure what exactly email editor ConvertKit provider. And I needed RSS campaigns and Auto resend feature, which ConvertKit didn’t have at that time. Still, comparing MailerLite to MadMimi it is also a good alternative. Do you have experience with MailerLite? Were you considering it as an option? I never looked into MailerLite Christina, although I have heard good things about it.